Automobiles and auto parts made in the Midwest and exported to Canada and Mexico. Beer brewed in Mexico sent to the U.S. for consumption. Corn, wheat and soybeans from farmers in the Midwest to Mexican food processors and livestock producers. Paper and forest products from Canada to build homes and provide packaging for manufacturers in the U.S.
Propane from western Canada to the U.S. Midwest. Refined energy products from the U.S. Gulf Coast to Mexico. Sulfur from Canada used to produce fertilizer in the southern U.S.
U.S.-made steel products to crude oil production centers in western Canada. 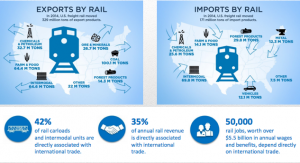 As you can see, the rail industry – and rail jobs – are heavily reliant on international trade. Profits generated from trade account for over a third of railroad jobs, and help pay for the wages and benefits that TCU has negotiated and won for our members.